Today I've a short post for you. My pc is almost dead, so I can't show you more than one, single photo. 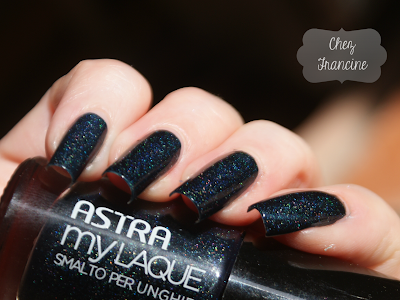 Anyway, Astra Glitter Party 03 is a deep blue based scattered holo. You could see two coats over my usual base coat, and one drop of top coat, to enhance the deepness of this lovely nail polish. Don't forget to take a look at my mates' picks, I'm pretty sure they have chosen gorgeous holos! Thanks for stopping by and have a nice week end! Post superveloce, oggi, ché il mio portatile è quasi andato. Ecco perché la faccio breve e vi mostro solo una foto. Astra Glitter Party 03 è un olografico con effetto diffuso color blu notte. Quelle che vedete sono due passate dulla mia classica base, ed un goccio di top coat, così da far risaltare la profondità del colore. Non dimenticate di passare a trovare le mie amiche! Sono sicura che saranno pronte a stendervi con i loro smalti olografici!